'My mom is going to rock!' Six-year-old Jaylyn and her pregnant mom, Nikki Taylor, team up to show off their enviable moves to 'Watch Me' by rapper Silento. Who said pregnancy has to stop moms from breaking it down? 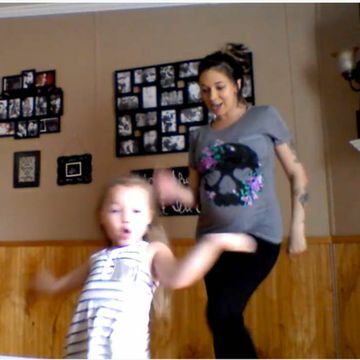 Mom Nikki Taylor—who is eight months pregnant—posted the video below of a mother-daughter dance break on Facebook, and it quickly went viral with over 23 million views since June 26. "My mom is going to rock!" tiny Jaylyn tells the camera before they start dancing to the song "Watch Me," by rapper Silento. The 6-year-old and her mom show off their best "whips" and "nae nae" moves for over three minutes. Jaylyn still has plenty of energy at the end, though it's clear pregnancy is taking its toll on the tired mama. "She kills me, I'm winded ... but this is as good as it gets," Taylor wrote in a caption alongside the video. The messages from viewers have been positive, too. "This is awesome and the best video i ever seen between mother and daughter," wrote Keith Woodcock. "This is adorable. The first thing my daughter said was 'See mom I'm not the only one that dances like that!'" added Brandi Stolte. She's right: Nikki and Jaylyn aren't the only parent-and-child dance team to show off their dance skills to what's turning into the song of the summer 2015. Austynn Samarco and her father posted their own version in mid June, complete with dad's countrified moves in jeans in a cowboy hat. Who wants to see a dance-off between the two families? Let's make it happen!